Whether you like your eggs firm or runny, fried or poached, it isn't always easy to decode the breakfast menu or tell your server the answer to "How do you want 'em?" at your favorite brunch spot. With so many ways to cook eggs, there is an ordering language just for eggs. 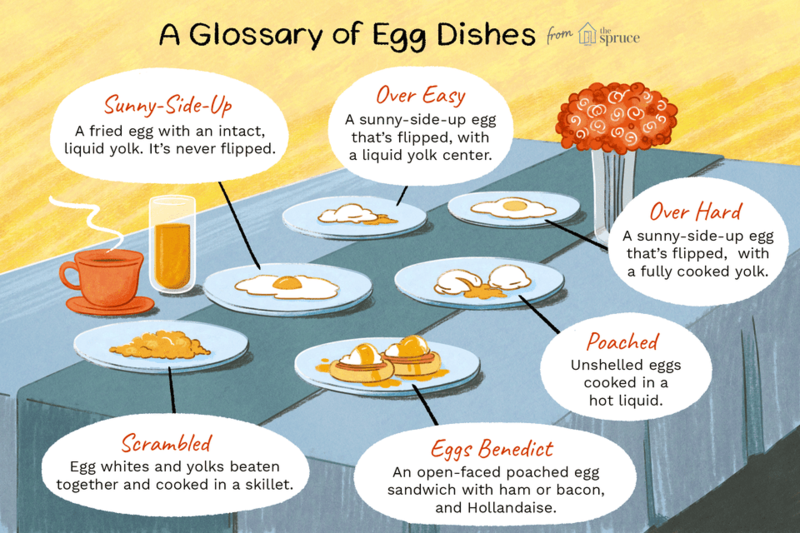 Here is a helpful glossary so you won’t be left speechless the next time you're asked how you’d like your eggs prepared. Maritsa Patrinos / The Spruce. A hard-boiled egg is an egg that is cooked in boiling water with the shell intact, cooked through until both the white and yolk have completely set. Similar to a hard-boiled egg, a soft-boiled egg is cooked in boiling water with the shell intact. The difference is soft-boiled eggs are cooked only to the point when the whites are set, but the yolk is still liquid. Poached eggs have been removed from their shells, then cooked in a hot liquid. The cooking liquid can be water, broth, or any sauce. Poaching in water is often used as a way to cook eggs without having to use extra fat. Poaching in broth or sauce adds flavor to the cooked egg. An egg is broken into a skillet or frying pan, carefully leaving the yolk intact. A fried egg is never flipped or cooked yolk-side down. The white cooks until completely or partially set, while the yolk remains liquid. An over-easy egg starts off as a sunny-side up egg, but once it's cooked on one side, it's flipped and cooked yolk-side down just long enough to create a film over the top of the yolk, leaving the center runny. An over-hard egg is an over-easy egg whose yolk is completely cooked through. It starts as a fried egg that's cooked on one side, then flipped and cooked yolk-side down until the yolk is no longer runny. You can also order your eggs "over-medium" if you'd like it somewhere in the middle. Raw egg whites and yolks are beaten together, then added to a skillet to make scrambled eggs. Sometimes milk, cream, sour cream, or cream cheese is added to make them fluffier or creamier. The beaten egg mixture is gently mixed as it sets to create a curdled texture. 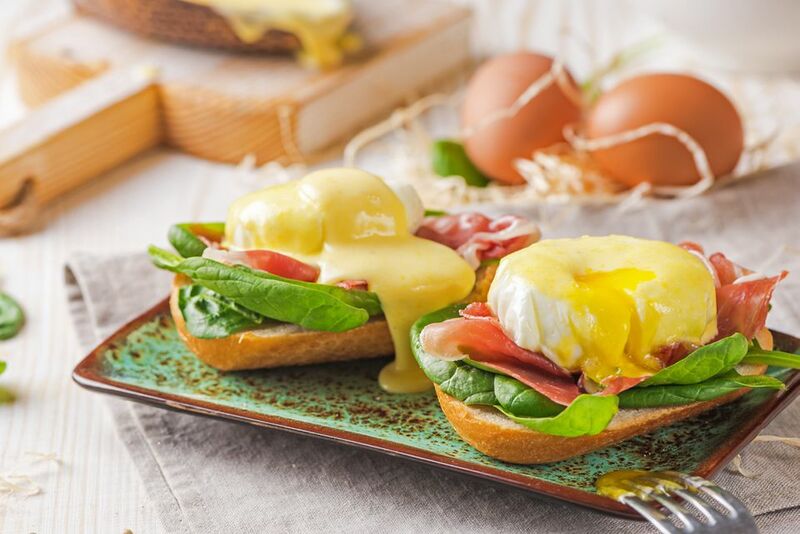 Eggs Benedict is an open-faced egg sandwich. Traditionally, a poached egg is served on top of an English muffin with ham or Canadian bacon and Hollandaise sauce. Twists on this traditional version may replace the ham with tomato, spinach, crab cakes, or even lobster. An omelet uses one or more beaten eggs that are cooked quickly (usually flat) in a frying pan. Omelets are often folded over a filling of cheese, vegetables, meat, or a combination of ingredients. Most restaurants will also offer an egg white omelet, using only egg whites, for a lower-fat version. A frittata is made by cooking an egg mixture until set. Eggs are beaten along with ingredients like cheese, vegetables, and meat. The mixture is then cooked slowly over low heat and either flipped or placed under the broiler to brown the other side. Shirred or baked eggs have been baked in a ramekin (sometimes with butter, cream or other sauces) until the whites have set, but the yolk is still liquid. Breakfast Scrambled Egg Croissants to Drool Over!